Dapat kasi walang pasok hanggang November 2 eh, hmp. We stayed at Fontana for the long weekend. It's been a tradition already for the family, since 1998, to stay there for Halloween, All Saint's Day, and All Soul's Day. What we do is check in there, settle down for a while, then go to Tarlac to visit our dearly departed. When we were kids, we used to stay in my Uncle's house. We usually have a blast because all our cousins are there, collecting candle drippings and making them into these humongous wax balls. But since our family has grown and grown, di na kami kasya don. And since we've all grown up, or grown older, di na rin keri ni Mommy ang mag-stay don. Besides, it won't be much fun because the cousins my sisters and I play with are now all married and have children. Yup, Darice has second cousins already. And so the weekend at Fontana. There was a Trick or Treat for the kids, as usual. Two years ago, Darice went as a witch, and then last year, as a princess (na tinutuhanan talaga nya ang pagkaprinsesa kasi napaka-bratty sya non). Being the craftster wannabe that I am, and having loads of free time, I just made the witch and princess costumes. But this year, being the lazy person that I am, and having tons to do at work, and feeling aches and pains all over my body, she just wore the gown she wore in Ate Ella's wedding. Payag naman sya, and besides, I made her wings naman, to make her look like a fairy princess (actually, she looked more of a butterfly because of those weird wings I made). She wouldn't have her picture taken during the trick or treat itself (don't ask me why, I'm just her mother =P ) and everytime I'd point the camera at her, she'd say, "No picture, no picture!" Feeling artista ang anak ko noh?! Well, they had a face painting booth at the event, and good thing Darice wanted me to take a picture of her face painting. 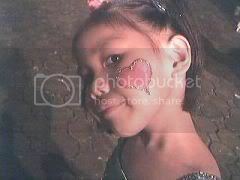 Na-excite ang bata. And so, aside from Trick or Treat, the kids had a blast at the Fontana Waterpark. 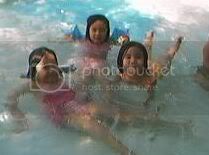 You'd think, parang yung mga bata lang nag-enjoy ah. Dinuguan, barbecue, inihaw na tilapia, lechon kawali, all kinds of goat dishes (erm, normal lang ang kumain ng kambing okay?) from our relatives. I thought I was going to faint with all the food. God, how I missed the Ilocano way of cooking (since I am living with Bicolanos - Dar's family - now). Ahh yes, a weekend of kabondatan for me and Dar, and a weekend of play for Darice. Good thing pala it did not extend up to November 2 at baka balyena nako ngayon hehehe.